If you're looking for substitute teacher jobs, know that there’s always more to learn about when it comes to polishing your resume. Your skills and experience must demonstrate your preparedness for the role, as well as your enthusiasm for the work itself. 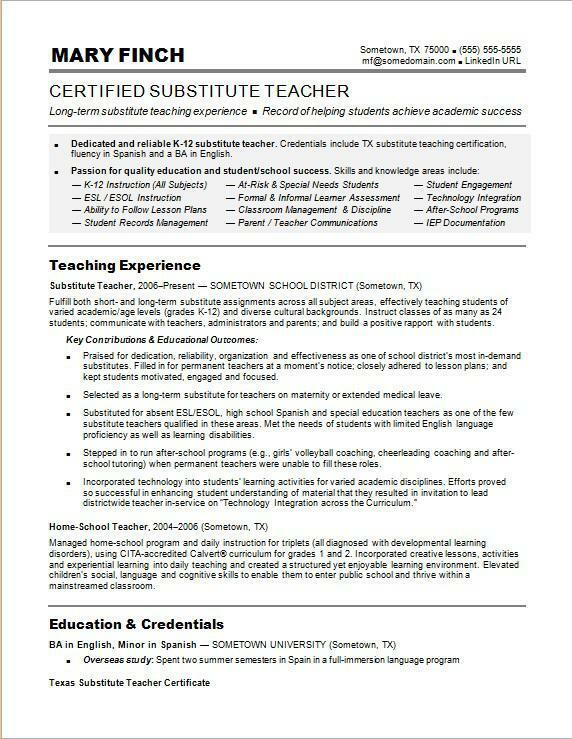 To help you move your candidacy to the top of the stack, view the sample resume for a substitute teacher below, and download the substitute teacher resume template in Word. According to the Bureau of Labor Statistics (BLS), you'll find the highest level of employment for this job in the following states: California, Texas, New York, Virginia, and Michigan; and in the following metropolitan areas: New York City; Los Angeles; Riverside, CA; Houston, and Washington D.C.
As a substitute teacher, you can expect to earn a median wage of $26,830 per year, or $12.90 per hour, according to the BLS. Dedicated and reliable K-12 substitute teacher. Credentials include TX substitute teaching certification, fluency in Spanish and a BA in English. Fulfill both short- and long-term substitute assignments across all subject areas, effectively teaching students of varied academic/age levels (grades K-12) and diverse cultural backgrounds. Instruct classes of as many as 24 students; communicate with teachers, administrators and parents; and build a positive rapport with students. Praised for dedication, reliability, organization and effectiveness as one of school district’s most in-demand substitutes. Filled in for permanent teachers at a moment’s notice;closely adhered to lesson plans; and kept students motivated, engaged and focused. Selected as a long-term substitute for teachers on maternity or extended medical leave. Substituted for absent ESL/ESOL, high school Spanish and special education teachers as one of the few substitute teachers qualified in these areas. Met the needs of students with limited English language proficiency as well as learning disabilities. Stepped in to run after-school programs (e.g., girls’ volleyball coaching, cheerleading coaching and after-school tutoring) when permanent teachers were unable to fill these roles. Managed home-school program and daily instruction for triplets (all diagnosed with developmental learning disorders), using CITA-accredited Calvert® curriculum for grades 1 and 2. Incorporated creative lessons, activities and experiential learning into daily teaching and created a structured yet enjoyable learning environment. Elevated children’s social, language and cognitive skills to enable them to enter public school and thrive within a mainstreamed classroom. In order to be considered for substitute teaching jobs, your resume writing needs to be a notch above the competition's. Not sure your resume will pass the test? Get a free resume evaluation today from the experts at Monster's Resume Writing Service. You'll get detailed feedback in two business days, including a review of your resume's appearance and content, and a prediction of a recruiter's first impression. Let the experts at Monster help you move your application to the head of the class.